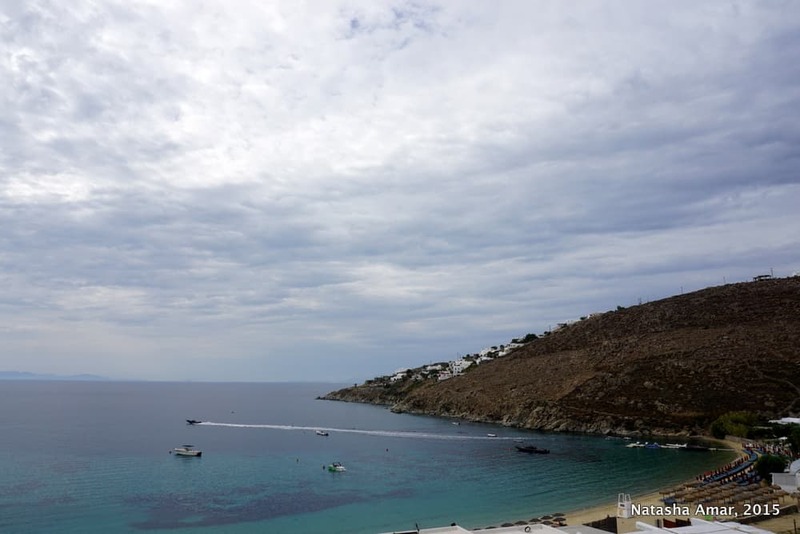 Don’t forget to watch my video of the highlights from our lovely stay at Mykonos Blu Grecotel Exclusive Resort (at the end of this post) to see for yourself just how beautiful the resort is. Mykonos was our second stop in the Cyclades, perhaps the most glamorous and popular group of Greek islands, and after a few days of relaxing and exploring the simple beauty of the villages of Paros, we went in search of a little more luxury and a livelier night life. We were not disappointed for luxury was in abundance at Mykonos Blu Grecotel Exclusive Resort, a gorgeous property by Grecotel Hotels and Resorts, located on the beautiful Psarou beach, one of the most well-known beaches in Mykonos, where sun-beds usually have waiting lists during the busiest summer months. Understandably then, this ultra-luxurious resort with its private stretch on Psarou beach makes for an ideal choice if you’re looking to get pampered with quality beach time (without having to waste any time getting there), enjoy laps in its dreamy infinity pool that overlooks the ocean, party with other glamorous folks at neighboring Nammos and retire to a tranquil space (that feels like a world away) for a good night’s sleep. 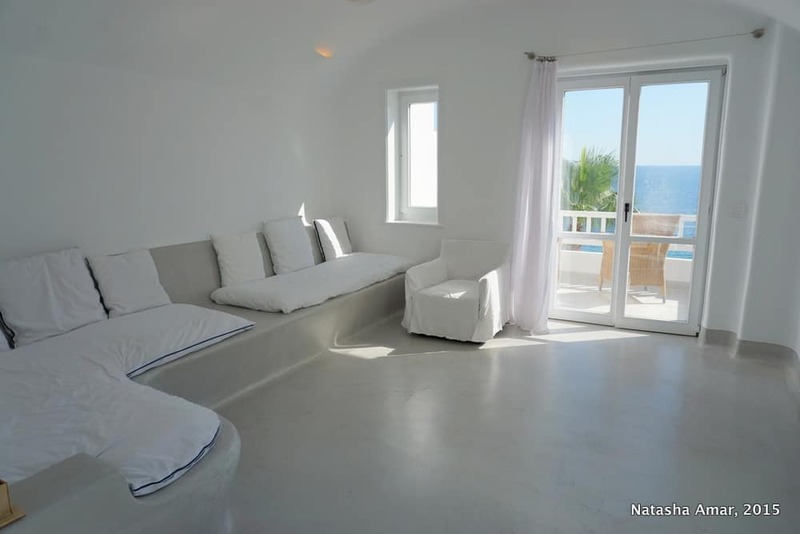 The all white buildings and décor of Mykonos Blu have a certain unexplainable calming effect as you walk in. It’s almost like having walked into a space that says, “Relax, you’re on vacation.” Two attendants rushed to help with our luggage and as we stepped inside, another member of staff escorted us to the Delos Lounges, the aesthetically designed rooftop bar that provided our first view of the myriad blues of the ocean and the golden sand of Psarou beach. We were served champagne and fresh juices, all welcome after our long ferry journey and the taxi ride from the port. Even as we enjoyed the views and champagne, the registration formalities were over before we knew it and we were being led to our room. The best part? We had been upgraded to a suite- obviously this was going to be something to look forward to! Our one-bedroom suite was brightly lit with plenty of sunlight streaming in from the many windows and balconies and this made me happy because I’m not a fan of dimly lit hotel rooms. The living area was tastefully decorated, yet simple and comfortable, almost like a minimalistic Cycladic home. I loved that everything was white, even the curtains. 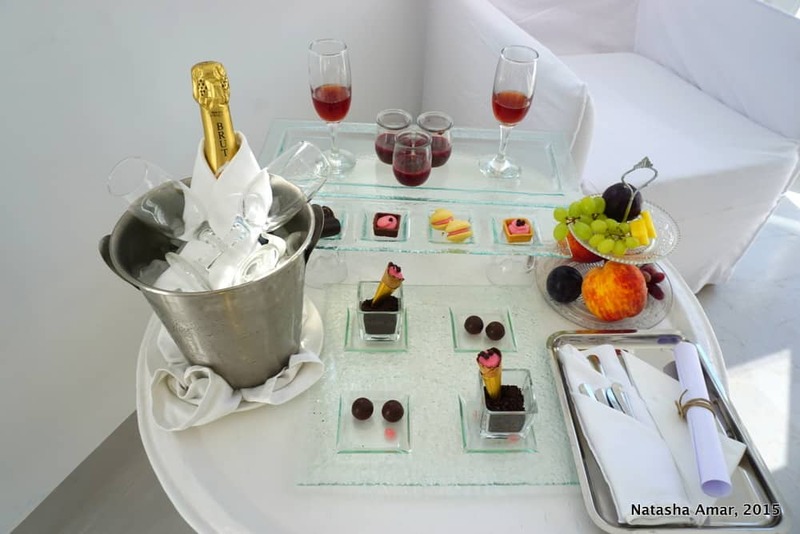 We were put in a good mood by the complimentary bottle of wine, (a standard practice for all guests) and the additional assortment of desserts and champagne. The balcony outside looked over the ocean and the beach and I wished I were staying longer because it would have made for a fantastic place to write. The white theme continued in the spacious bedroom, which had an even bigger balcony with the same view, and two comfortable loungers that seemed ideal to watch sunsets from. There was a second LCD TV in the bedroom and we watched it for a while before heading out for lunch. As the balcony looked over the lively afternoon party at Nammos, ‘the place to be in Mykonos in the afternoons’, as we were informed by the staff, I wondered if the sound of merry-making affected the quality of sleep and quiet in the rooms. My doubts were dispelled later in the evening when housekeeping staff came to shut the windows and balcony doors, completely sound-proofing the room and I dozed off for an evening nap. 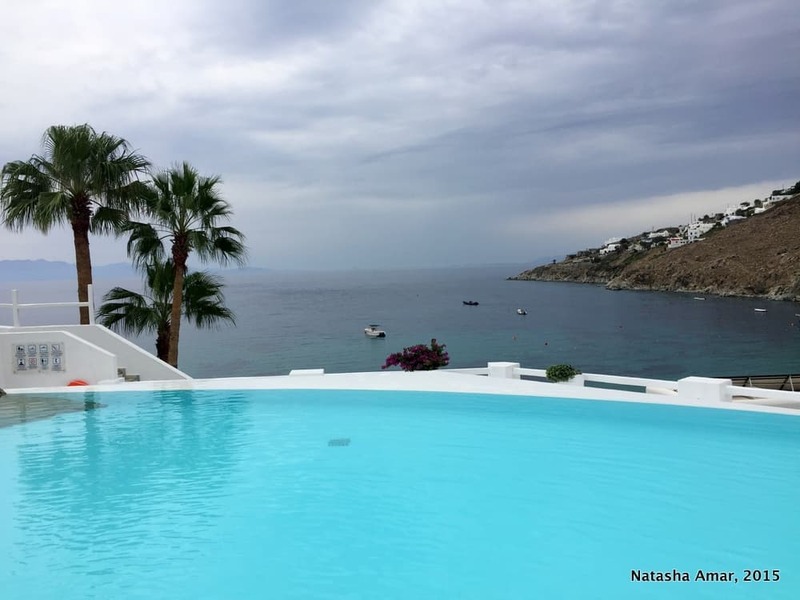 The two-level infinity pool in Mykonos Blu overlooks Psarou beach and this is probably one of the best views on the island to swim to. It was the kind of setting that made us want to forget about what we had planned for the rest of our day and lounge around for a little longer. But we were only steps away from what is possibly the most beautiful beach in Mykonos so we headed to the beach area and an attendant quickly appeared with beach towels. She led us to available sun-beds and set up an umbrella for us. This stretch of the beach was open to hotel guests only and was not at all crowded. The party continued at Nammos right next door and it was lively but not obnoxiously noisy. I took a quick dip in the beautifully clear but cool water and returned to my sun-bed, content with a little nap. A hard-to-beat location around the photo-worthy swimming pool area, a lovely view over the Aegean, and delectable contemporary cuisine served al fresco style make L’ Archipel Brasserie an ideal spot to enjoy lunch and a late breakfast. As everywhere else in the hotel, the service here was friendly and the wait for our meal was hardly long. 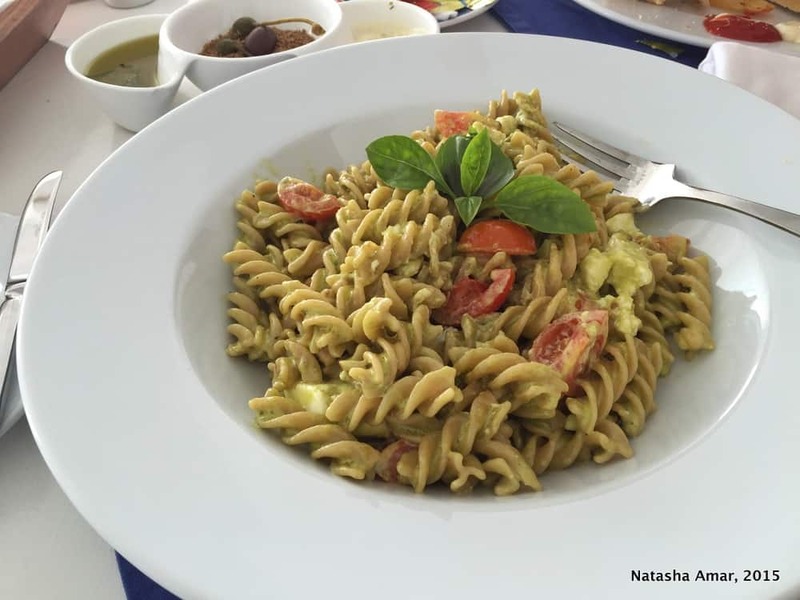 I tucked into my Greek pasta- Trivolaki and it tasted even better than it looked, and I relish every forkful. Ankit ordered a chicken and egg club sandwich and it was just as delicious. A lavish spread of Mediterranean goodness, the buffet breakfast at Aegean Poets was a leisurely affair that we enjoyed al fresco with the same fabulous views that are everywhere in the resort. There was a selection of meats, cheeses, breads, salads, fruits, egg preparations, pancakes, pastries, pies, preserves and of course perfectly creamy Greek yogurt. Service is impeccable in every way and the friendly staff is eager to help in all areas of the resort, from housekeeping and the beach to the restaurant staff. The hotel provides a frequent shuttle service as well as a car to deliver guests to the old town and bring them back to the hotel. As we waited for the shuttle, a member of staff kindly offered to drive us. He made recommendations for restaurants and bars, helpfully writing them down for us. We followed some of his recommendations and found they were all excellent suggestions aligned with our own tastes. Mykonos Blu also has a fitness center with gym and the Elixir Spa that offers a range of facial and body therapies. 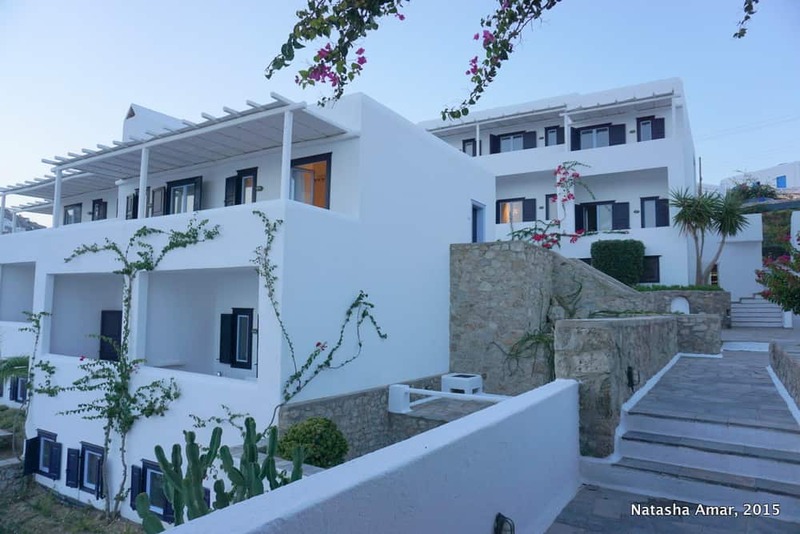 Mykonos Blu Grecotel Exclusive Resort is an ideal choice if you want a real taste of the luxurious and glamorous lifestyle that Mykonos is so famous for.It’s the kind of place where everything is taken care of and all you need to do is show up, look your best and enjoy your vacation. It’s suitable for families looking to make the most of a beach holiday and couples who want to enjoy a romantic break in Mykonos. 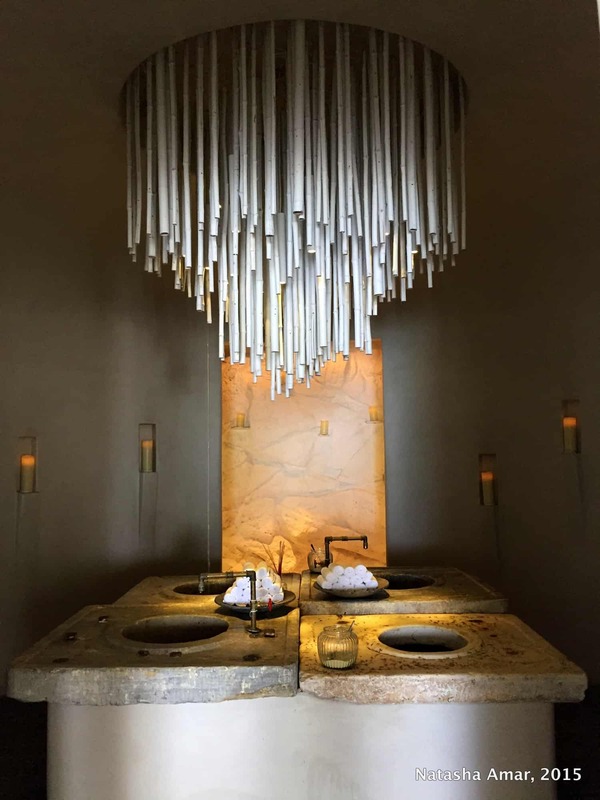 Our overall experience at Mykonos Blu was great and exactly what we had imagined given the reputation of the Grecotel luxury chain. Here’s a short video of the highlights- you’ve got to see for yourself how beautiful the place is! The décor- Blue and white and wonderfully Cycladic, the décor here is so pleasing to the eyes and proves that simple and tasteful can be far more elegant than unnecessary opulence. The service- Always friendly and prompt. 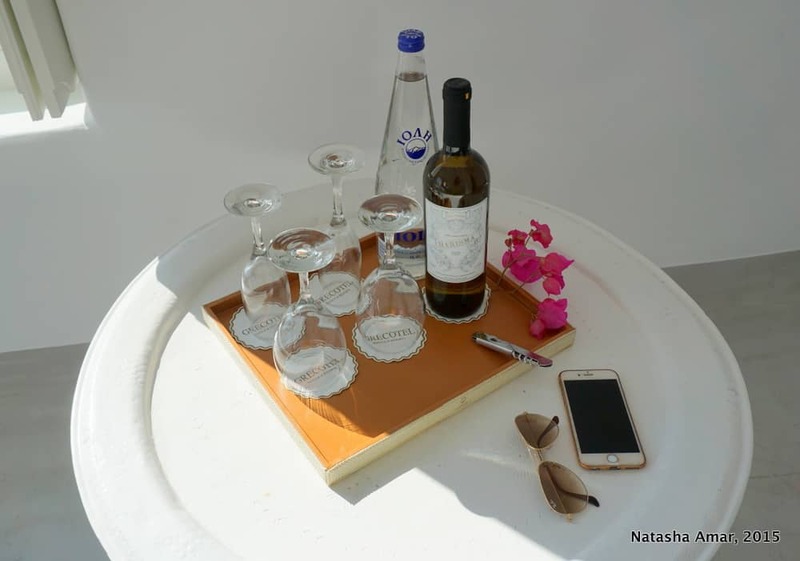 The welcome- After a long journey, the last thing you want is a lengthy check-in process and Mykonos Blu really did away with the usual blandness. Finally, the views- Whether it was from our suite, the rooftop bar, or the pool veranda, the views were always fantastic. 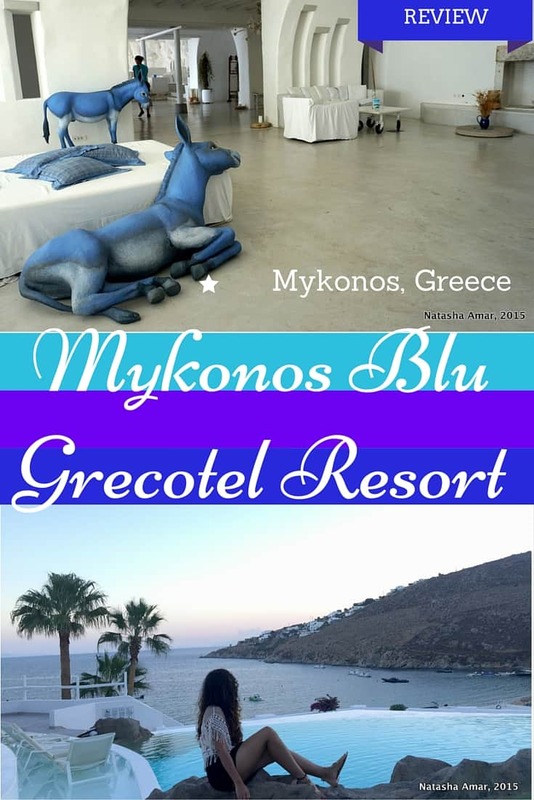 You can connect with Mykonos Blu Grecotel Exclusive Resort via their website. Disclosure: We were offered a special media rate for our stay at Mykonos Blu Grecotel Exclusive Resort. All opinions are honest and independent. If you like this post, please share it to Pinterest by pinning the image below or any of the ones above. All I can say is…wow! This looks completely amazing. Loving that top shot. So glam. I figure if you want pampering in Mykonos this is the way to go. Blogging from Paradise may need to take a visit. Thanks so much for sharing. I see these wonderful views and it makes me really start to miss Greece. Mykonos itself, is one of those islands I have longer to visit but still have not made it there. However, not if, but when I do I think I may have found where I will be staying. Thanks for sharing. I miss this stunning island. I just love the Greek Mediterranean décor, the simplicity and comfort of the starting lines, blue and white colour. Thanks for the tips, the Mykonos Blu looks like the place I would like to stay! 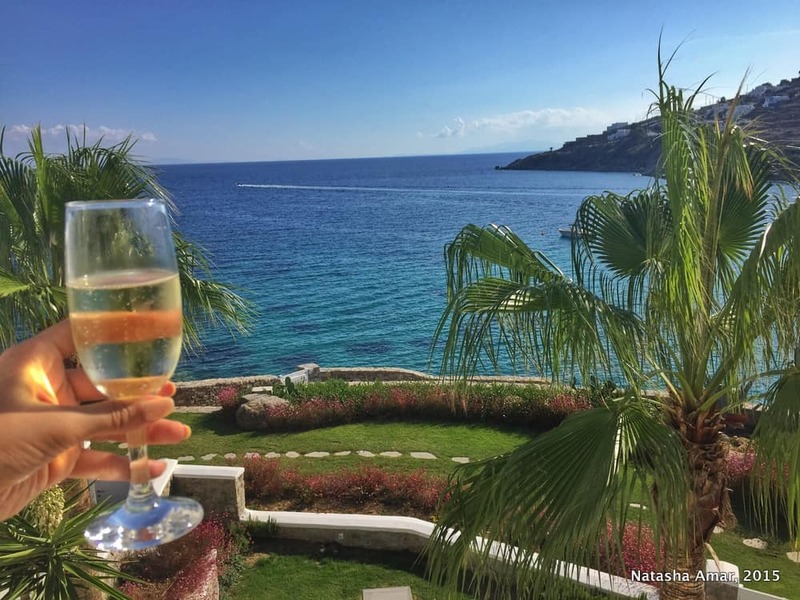 Sounds fantastic – I think Mykonos is one of those place where it really does pay to splurge and stay in luxury. One of those trips you’ll remember for a lifetime. 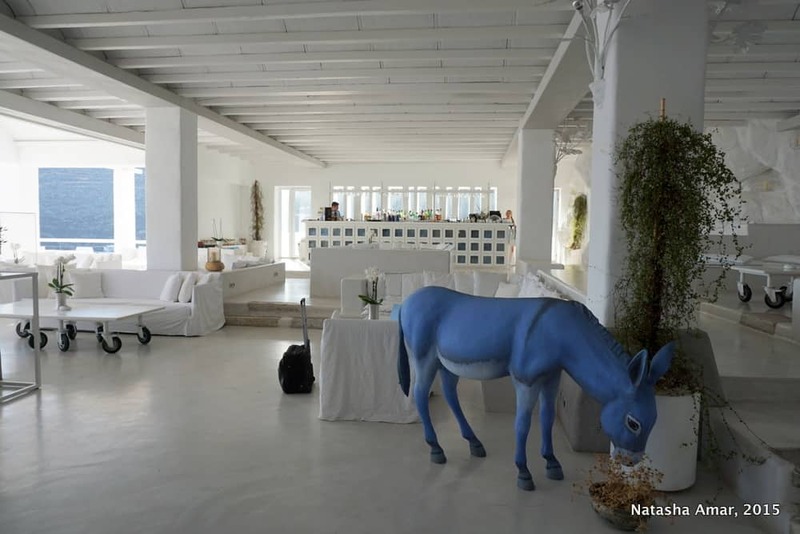 And I love the blue and white decor – really goes with the picture in my head of the Greek Islands! Love! Thanks for introducing me to Mykonos Blu Grecotel Exclusive Resort! Thanks for the comment Meg and yes, Mykonos is very commercial so if you’re willing to pay just a little more you get a lot more value for the price. It is a really beautiful place. I love that the decor is white as it contrast nicely with the blue ocean. The views from the property is amazing and the service sounds good and food looks good as well. 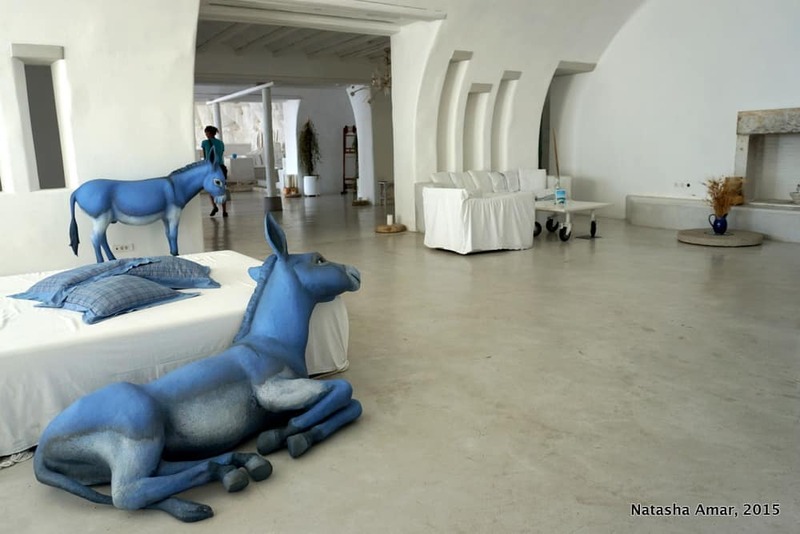 The Mykonos Blu looks like it would fit the bill for us :-). 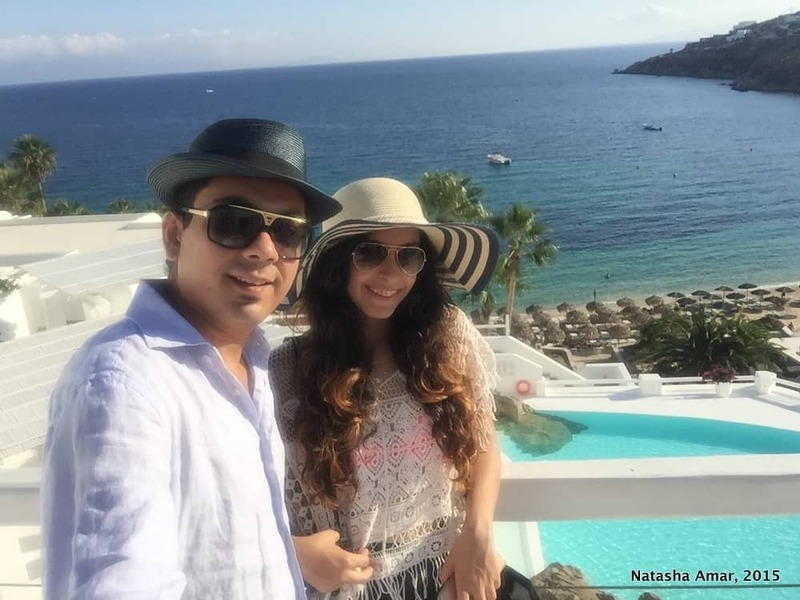 We enjoyed staying at Kivotos Hotel (beautiful boutique place) and Santa Marina (a Starwood Luxury property). Both Mykonos and Santorini have a good selection of luxurious resorts to choose from! I haven’t visited Santorini yet, hope to do that on my next visit to Greece. I love the idea that everything is in white and blue! Totally, really brings out the essence of the place and Mykonos itself. What a stunning hotel. 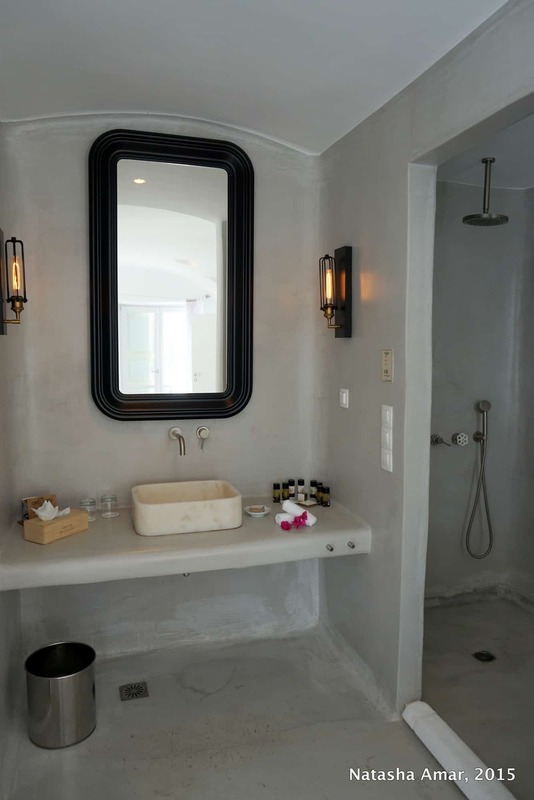 I love that they’ve kept with the local style but somehow made it ultra luxurious! Thanks Fiona, they’re all about understated luxury which is the best kind really. Wow!! Looks absolutely beautiful. Those views alone are worth going for. I agree! 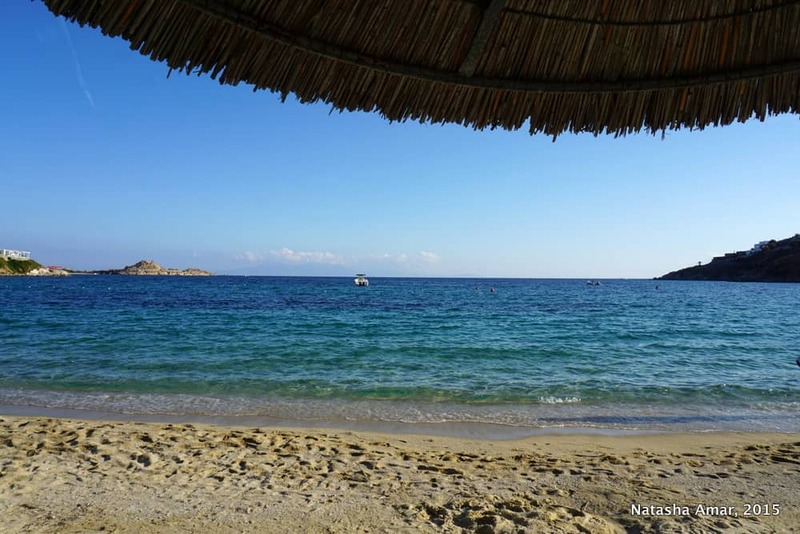 That’s one of our big reasons to choose Mykonos Blu, the views and Psarou Beach are fantastic. Awesome! Loved the video 🙂 the places does look very cool. It seems that Mykonos is just not going to disappoint anyone. All these blue and white washed walls, such a beautiful place! Awesome, look at those views!